Come colmare il divario tra ricerca scientifica e la creazione di imprese? Come investire nel potenziale imprenditoriale di dottorandi e dottori di ricerca STEM? Through an in-depth analysis of existing entrepreneurship programmes, accelerators, science/technological hubs and incubators (all named as “company builders”) in the EU and beyond, the SCIENT study identifies the existing gap in South EU countries and the best practices from North EU countries so as to develop a new, top-quality pre-accelerator programme for PhD STEM students/graduates. Since scientific knowledge lies at the heart of the European knowledge economy, SCIENT focuses in developing successful scientific entrepreneurs. The participating South EU countries (Cyprus, Italy, Spain, Portugal and Malta) and Lithuania have been suffering from the ongoing economic crisis. At the same time they have witnessed increased activity for start –ups, through private initiatives. Starting their own company seems to be only viable option for young people nowadays. Besides reducing youth unemployment rates, entrepreneurship contributes in economic development and growth. Thus investing in entrepreneurship education is one of the highest return investments Europe can make and our partnership will work towards this direction. Over 5 million young people (under 25) were unemployed in the EU-28 area in the second quarter of 2014. 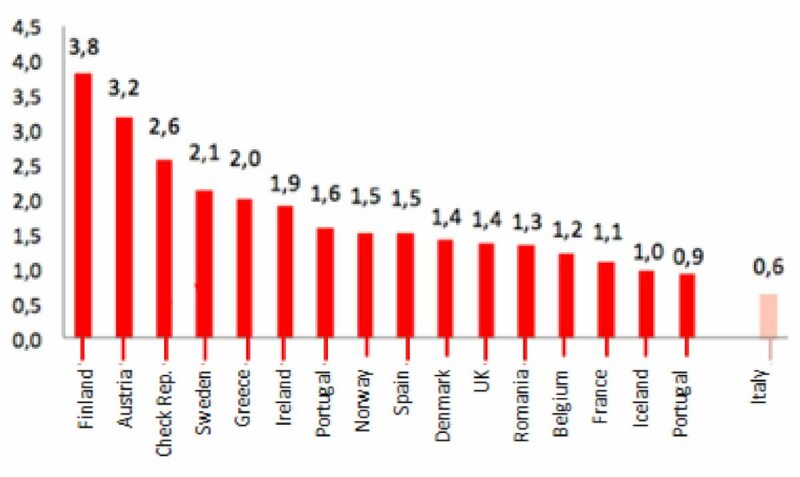 This represents an unemployment rate of 21.7% (23.2% in the euro area). This is more than twice as high as the adult unemployment rate (9.0%). 7.5 million young Europeans between 15 and 24 are neither in employment, nor in education or training (NEETs). In the last four years, the overall employment rates for young people fell three times as much as for adults. There is a gap of nearly 50 percentage points between the EU country with the lowest rate of youth unemployment (Germany at 7.8% in July 2014) and with the EU country with the highest rate, Spain (53.8% in July 2014). Spain is followed by Greece (53.1% in May 2014), Italy (42.9%), Croatia (41.5%), Portugal (35.5%) and Cyprus (35.1% in June 2014). Although the number of such “company builders” initiatives have increased dramatically in the past few years (e.g. there are more 150 accelerator programmes across Europe), the percentage of young people participating in these programmes is small compared of the total number of interested/would-be entrepreneurs, due to increased competition. Thus there is still a need to develop new, more targeted training programmes for those groups of the population that have the highest potential to propose innovative products and services to the market. PhD students/graduates are considered the brightest minds, with top academic records and with research/innovative results at hand, failing, however, at the same time to turn their findings into marketable products or considering entrepreneurship as an attractive career option. To deal with this issue and by responding to external pressures, universities have changed the way they operate. Entrepreneurialism is not a foreign concept anymore. There is an increasing interest in co- operating with businesses and many universities now include outreach activities such as knowledge transfer in the form of spin-offs and incubators. Thus the market for academic teaching jobs is entirely different today than 20 years ago. However, most PhD students still operate in the old way: present at conferences, network in their field, be active in their department, work with someone of great renown, submit papers for publication, apply for fellowships, and then secure a tenure-track position. This approach is no longer adequate to progress professionally and ensure a career in academia. PhD students need to step outside of the traditional boundaries and have the skills/qualities of entrepreneurs: work in other fields to define themselves, produce tools, appeal to wider audiences and forge partnerships beyond their disciplines and academia. Since with every crisis comes opportunity, it is a hidden blessing if some of our PhD students/graduates follow other professional paths by utilising their research findings to create their own companies. In terms of relevant EU policies, since 2008, Europe has been suffering the effects of the most severe economic crisis it has seen in 50 years: currently there are over 25 million unemployed, 5 million of them being young people3. Correcting the problems of the past and putting the EU on a more sustainable development path for the future is a shared responsibility of the Member States and the EU Institutions. Entrepreneurship has been set as No.1 priority by the EC, as it seems to be the only way to deal with high unemployment rates of young people. Entrepreneurship is also a powerful driver of economic growth and job creation: it creates new companies and jobs, opens up new markets and nurtures new skills and capabilities. To this regard, Europe has developed the Entrepreneurship 2020 Action Plan in 2013. Our project embraces the objectives of Pillar 1 and Pillar 3, namely entrepreneurial education and training and having a change in the perception of entrepreneurs through practical and positive communication, using mostly the media. SCIENT is also in line with Europe 2020 strategy, which places knowledge at the heart of the European Union’s efforts for achieving smart, sustainable and inclusive growth. The fields of education and training are recognised as key drivers within the Europe 2020 Strategy to overcome the socio-economic crisis affecting European countries, fight rising levels of unemployment, particularly among young people and boost growth and jobs. 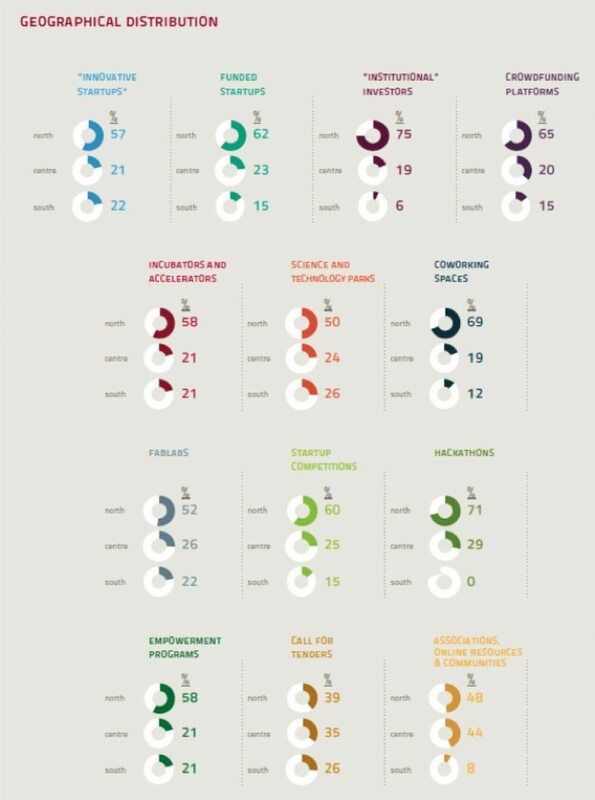 Thus the increase in the number of new entrepreneurs and the enhancement of entrepreneurship mind-set and skills remains a top priority for Europe and all participating countries for 2014-2020. Through SCIENT an innovative entrepreneurship programme will be developed for STEM PhD students/graduates, assisting the EU to capitalise on the untapped business potential of young scientists, who can create their start-ups, reduce unemployment and boost economic activity. Also the ET2020 strategy has as a strategic objective the enhancement of creativity and innovation, including entrepreneurship, at all levels of education and training. The functioning of the knowledge triangle education-research-innovation and the acquisition of transversal competences will be ensured through SCIENT. The Knowledge Alliances Action also aims for the co-development and implementation of new learning multidisciplinary curricula, the development of entrepreneurship mind-set and skills and the practical application of entrepreneurial skills, which can lead to the commercialisation of new services, products and prototypes and to the creation of start-ups and spin-offs. This chapter is dedicated to a brief insight into the Italian entrepreneurial context. Considering that one of the SCIENT project objectives is to transfer best practices and successful examples from North EU countries that have long-term experience in entrepreneurship and accelerator programmes to South EU countries, we will also be referring to the regional frameworks of the two Italian project partners: Aster from Emilia-Romagna (North) and CESIE from Sicily (South). 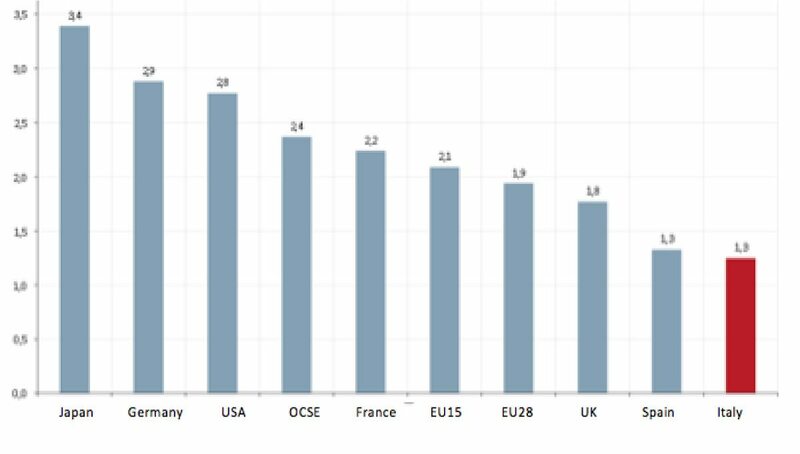 At centralized national level, the resources available and the actual spending for Research and Development of the overall GDP is below the European average and less then of the main industrialised countries (figure 1). According to the data of the report published in 2014 by ANVUR National Agency for the Evaluation of the University System and Research on the state of the Italian university system, it is evident that also Higher Education Institutions and PhD have profoundly been affected by the deleterious cuts implemented since 2008, when there has been a reduction in spending on education and for public education defined as savings of €8 billion in three years (from 2009 to 2012). At the moment, education accounts for 6.8 per cent of the public budget and 4.64 per cent of total GDP. For doctoral studies, in particular, the reduction of positions banned in 2014 throughout Italy was very high (-9%), with a negative peak (-38%) in the regions of Southern Italy. 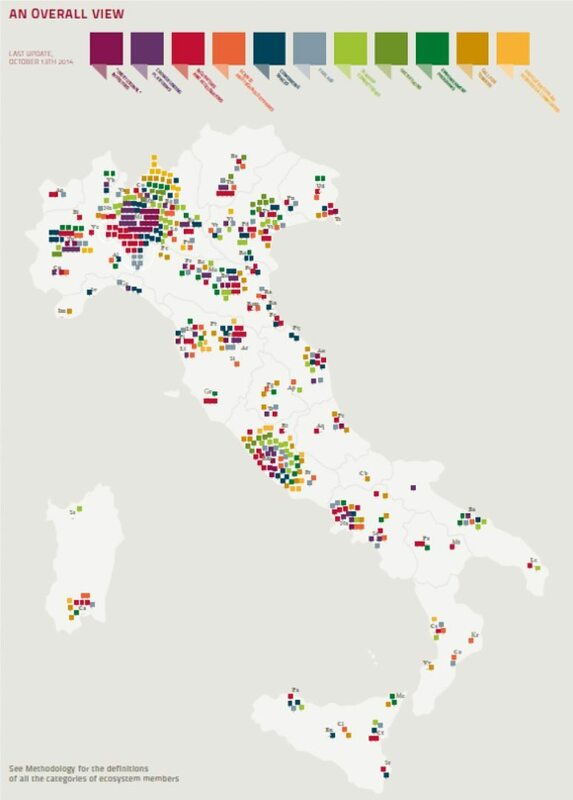 A similar reduction also occurred in the number of banned PhD scholarships that each year decreased of 16% between 2008 and 2014, and with an uneven geographical distribution that disadvantages once again the territories of southern Italy. 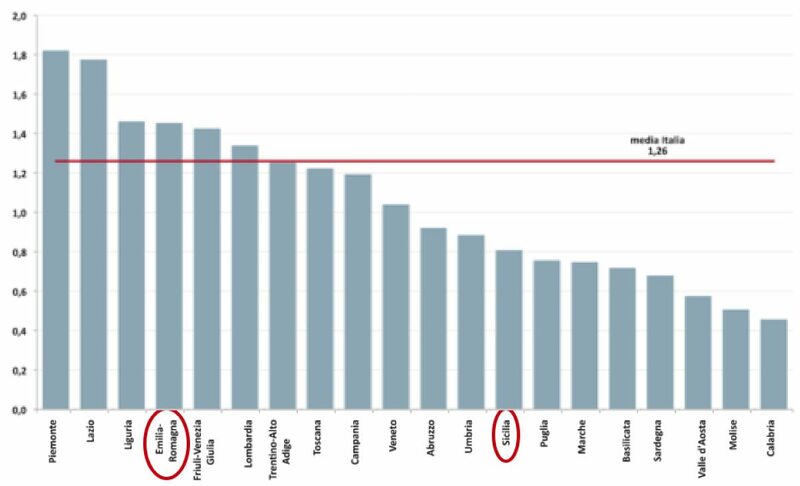 As below in Figure 2, there are significant regional differences, with some Italian regions aligned to the EU average and others, mainly in the South, far below. Although employment is high in all areas, in particular among doctorate holders in mathematics and computer sciences, industrial and information engineering (above 95% for the doctorate holders) – the figures above still reflect into the below graph, as it shows that in Italy there are only 0,6 PhD students per 1.000 inhabitants. The concept of “innovative start-up” was actually introduced in Italy only with the Decree “CRESCITA 2.0” (n. 179 of 2012) aiming at promoting the employability of qualified human capital in parallel with the spread of new entrepreneurship and technological development. Indeed, startups are one significant job opportunities for PhD and graduate students who are nearing industrial research career and not to the academic, but it is still a limited phenomenon mainly due to the high business mortality. The Government reacts by putting in place Law 221 passed in December 2012, that allows Italy’s innovative startups to: register online, for free; apply a tailor-made labor law within their team; remunerate team members and consultants with stock options and work for equity schemes with favorable and simple capital gain tax treatment; pay variable salaries depending on the company’s performance so as to incentivize workers; benefit from more flexible corporate governance tools; access to equity crowd funding portals (first specific set of regulations in the world! ); have a fast-track, simplified and free-of-charge access to a government guarantee fund covering 80% of bank loans; and, in case things go wrong, make use of a fail-fast procedure, allowing the entrepreneur to start a new business project as soon as possible without suffering reputational cost. Of no less importance is the fact that angel investors and VCs can profit by tax incentives ranging from 19 to 27% for investments in such companies, a measure that ranks us among the friendliest places where to invest in new innovative businesses. In August 2015, the number of innovative startups entering the special section of ‘Register of Companies’ actually increased, reaching 4,510 units. 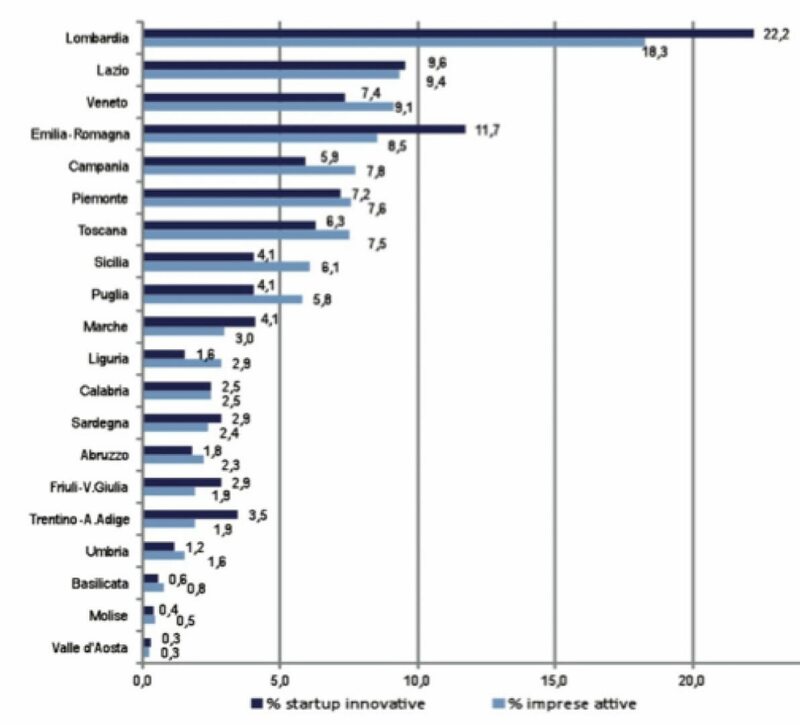 Startups represent 0.25% of the nearly half million Italian companies (see figure 4, next page). The share capital of the startup has a total of 192 million euro, which corresponds to an average of approximately 52,000 euro in business. The initiative – undertaken in cooperation with the Conference of Italian University Rectors and Confindustria (Confederation of Italian Industry) – will allow 136 highly skilled young people to approach highly innovative and research-oriented companies, for a period of two years, at least. Out of a total budget of 16.236 million euro, 11 million were allocated by MIUR through the Special Integrative Fund for Research, the rest was given by privates. The Italian Government policy launched the Italia Startup Visa program (2014) to create new enabling conditions for the development of our startup ecosystem, aimed at attracting innovative entrepreneurs from all over the world. A healthy startup ecosystem needs to be constantly fueled with new skills and talents as well as multiply its commingling to other innovation scenes: this is what is happening thanks to Italia Startup Visa. A new experimental initiative, called Startup Europe Partnership, aimed at strengthening the ties between traditional industries and high-tech startups has been launched by the European Commission in January 2014 at the World Economic Forum in Davos, SEP is the first pan-European platform dedicated to transforming European startups into scaleups by linking them with global corporations. All the above measures contributed to positive movements within the ecosystem helping to generate a virtuous cycle within it. In particular, over the last year there has been a growing number of innovative startups (up 120%), funded startups (up 74%), “institutional” investors (up 16%), startup competitions (up 58%), online resources and communities (up 35%). SCIENT is still an ongoing research initiative. “A country divided and unequal, where the South slides further down: in 2014 for the seventh consecutive year, the GDP of the South is still negative (-1.3%); the gap in GDP per capita has returned to the levels of 15 years ago; during the crisis years 2008-2014 investment in industry excluding construction fell of 59%”. Source: (MIUR) Ministry of Education, Universities and Research. Publication date: 08/06/2014.